Spring in New England means a delightful and dramatic return of living and growing things outside. This year a bevy of a dandelions, liberally seeded by an exuberant two year old last year sprung into bloom, dotting the yard with yellowness. We also played host to wild violets, delicately commandeering our yard, gardens, walkways, and any possible corner and crack. The exuberant two year old has turned into a three year old whose exuberance has only been punctuated with self assertion and initiative. Her joy of living reigns free and flowers possess no pass when she decides to fully enjoy her little world. And so with the spring came bouquets of dandelions and violets, hyacinths and tulips, any flowers within her reach picked in handfuls and delivered with kisses and sheer excitement. She would grasp the flowers, and run to me calling for my full attention. Her enthusiastic gift giving required equally enthused receiving. Once she secured my delight, the adventure to bring more beautiful and living things into the house immediately resumed. Dandelions and wild violets are not the finest of flowers. They are mildly pretty as wild things, but bring their own category of annoyance of a yard owner. To many homeowners, subduing the earth means eradicating these flowers. They bring color and variety to the world and serve a purpose in their own right. But they fade and they wilt rather quickly. However, there was a peculiar beauty in them for me. I found myself smiling and matching her delight as she ran, fist clenched full of yellow and purple. She saw wonder in this life around her and her instinct was to share it with the people she loves best in all the world right now. In our fallen world, we see the beauty and structure of a perfect Father. We enjoy the gifts He gives us. He grants us the joyful ability to converse with Him, to see His hand in creation, to mirror Him with our creativity, to share our hope with those around us. By participating in these abilities He has given to us, we too offer gifts to Him as a way to glorify and enjoy Him. Our gifts are, in reality, like those dandelions and violets. Unnecessary, fading, and incomparable to His gift of redemption. But He still delights in our living and moving and enjoying. I certainly don’t need the piles of dandelions I was given this spring. But I treasured them because they symbolized life and joy. I didn’t need the bouquets of violets and hyacinths when I had vases of roses. But violets became as beautiful if not more so than roses because they were given with sheer enjoyment and passion. I didn’t really want the two blooms from the lone tulip plant plucked off the stem the very day they bloomed. 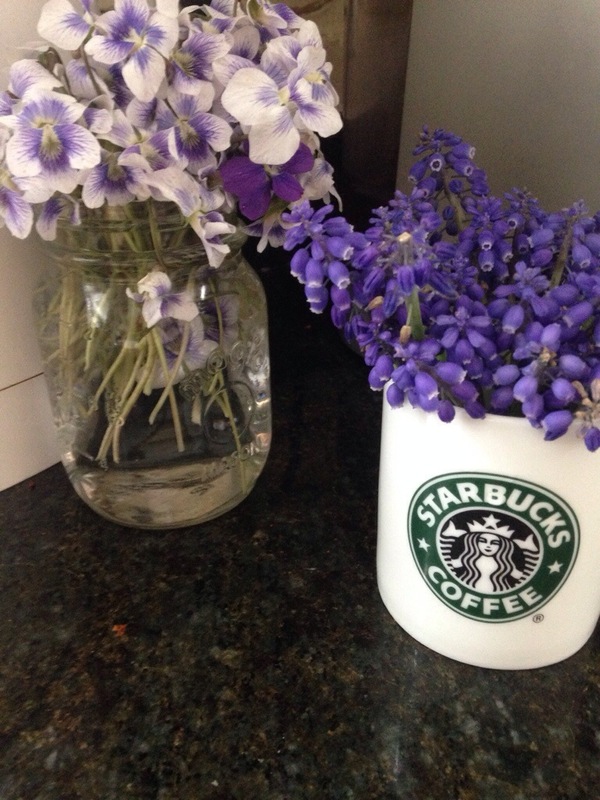 But I took those short blooms, salvaged them, joining them with lilacs into a reconstructed and simple bouquet. God takes His children, and our gifts, and our failures, and in our souls He salvages the the beauty of His creation by looking at Christ. He takes the mess and the temporal and the unvaluable and makes it treasure in which He delights because He sees Christ. He looks on us and sees life. He created us for joy and thru Christ, we share this gift. The delight in dandelions and violets should never be discounted because God has ordained that they serve a purpose. Just as He has ordained that we live fully in Him, living, moving, glorifying, and enjoying.